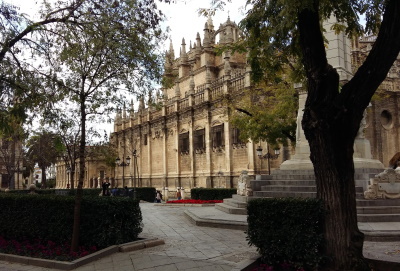 The Cathedral, Alcazar and Archivo de Indias in Seville are testimony to the civilization of Christian Andalusia. All three of them are also directly connected with the discovery of the New World by Christopher Columbus. His tomb lies in the Cathedral, the Archivio the Indias houses an important collection of documents from this period in time. The Cathedral of Seville is also the largest Gothic building in Europe. Its Giralda Tower was constructed as a minaret during the 12th century, when a large mosque stood at this site. After the Christians reclaimed Seville, they left the minaret intact. From the famous cities in Andalusia, Seville impressed me as the most sophisticated. And expensive. And the one with the most American tourists. Conclusion: the heart of the city is beautiful in a cultivated way, a bit too much cultivated to my taste however. One of the best things are that these 3 sites are next to each others so you can visit them in one day if you want. I visited only in the cathedral and Alcazar. 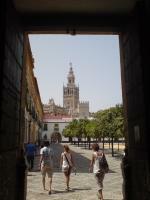 It was very cheap visit for me: for students entrance to cathedral is only 2 euros and entrance to Alcazar is free! The gardens were my favourite part in Alcazar. I think Alcazar is as interesting as Alhambra. In cathedral I liked the treasures that they had there. The city centre of Seville is quite compact and full of pedestrian only areas, so walking is really the only option. Having taken a #32 bus from Santa Justa station to Encarnacion, I made this my base for further explorations. Besides visiting the WHS I enjoyed an early morning stroll through Barrio Santa Cruz while waiting for the Archivo to open at 10am. An outstanding feature of Seville were the generous discounts offered to seniors at the cathedral and the Alcazar. Seville was the most enjoyable city that we visited on our trip through Western Andalucia. It had the feel of a cosmopolitan, modern city and had plenty of things to keep us entertained for three days. Of the three inscribed sites it was the Alcazar that was my favourite. The level of decoration was incredible. A fair few rooms still have some of the original colourings in the plasterwork, and as you would expect the tilling is magnificent. 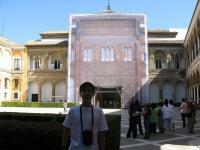 As stated before there are two parts to the Palace: the more famous Mudejar part and the later Gothic sections. The later, though not as impressive is still a very pleasant place to wander around. The gardens were also worthy of much exploration. I gave the Alcazar 1.5 hours but still didn't feel that I did it justice. I could've certainly spent the best part of a morning or afternoon there. The Cathedral is massive especially when you view the interior, and the Giralda tower is very understandably the cities main landmark. It's heritage can be clearly seen as it is very similar to the Koutoubia Mosque's minaret in Marrakesh. 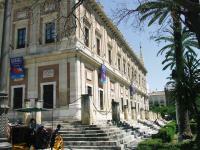 I completed the sites by visiting the third of the inscribed sites the Archivo de Indias. Architecturally it is not particularly remarkable, though the undulating roof does look interesting. Its main importance derives from the fact that the archives house a huge array of documents chronicling Spanish rule and trade in the 'New World'. The galleries are themselves impressive and there are continuously changing exhibitions that highlight certain parts of the Archive. When I visited the exhibition was on Spanish influence on the United States and was very interesting. On display were things such as the first map of San Francisco bay and legal documents from early settlements in Florida. I actually found it a rewarding experience and helped to under line the role that Seville played in trade with the Americas. A side from the World Heritage listed buildings I enjoyed wandering around Seville, the area designed for in 1929 Spanish American exhibition was very nice, especially the wonderfully over the top Plaza de Espana. Also very nice was Calle Betis which is the river front road in Triana filled with Tapas bars and restaurants which provided a great way to relax in the evening overlooking the sights of Seville. All in all I really enjoyed Seville and the WHS is a very worthy inclusion on the list. I spent some more time in Andalucia so i coulnt skip all the WH site which are located here. I started with Seville - it is a town which absolutely deserves the WH title. It is a vibrant town with great food, architecture and people. Cathedral from outside maybe doesn't look like the biggest gothic one but as you are inside you start to believe it. Next of all those pillars holding the ceiling you feel so small. Cathedral itself is surrounded with several chapels and with former minaret and now a bell tower - Giralda. There are no stairs inside just a ramp where horses were used in past. View from the top is breath taking. Later i visited Alcazar and its gardens. This is for me the top of Sevilla. I could spend there whole day without even realising it. Palace is divided in parts - gothic and mudejar (which is nicer). In comparison with Alhambra i liked this place more. So the best advice is to plan at least 2 hours for visiting Alcazar. The Seville Cathedral is supposed to be the world's largest; it's immense size is quite a sight. The interior is also impressive with its numerous chapels and tombs. The Spaniards claim to hold Christopher Columbus' remains at the cathedral although the Dominican Republic also claim to hold it. Nevertheless, his tomb at the cathedral is still beautiful with the four kings representing the kingdoms that make up present-day Spain carrying it. The Royal Chapel or Capilla Real housing several royal tombs is off-limits to tourists although I managed to peak through the curtains. Finally, the view from the top of the Giralda Tower aftering a tiring climb of 34 ramps is both breathtaking and rewarding. The Alcazar, right next to the cathedral, is also worth visiting. We had to catch a train to Granada so I only had about an hour to visit it, but from what I saw, the place shared many similarities with the Alhambra in its architecture and beauty and its garden was gorgeous with its palm trees. I would absolutely suggest a visit. Both the cathedral and the Alcazar were undergoing restorations at the time of my visit and some restored areas were covered up with life-size pictures showing what was behind it. I've attached a picture to demonstrate the practice. from the bullring, but I can't remember the name of the area. I really enjoyed our stay in Sevilla. Seville's Cathedral, with two aisles plus chapels on each side of the nave, is the world's largest Gothic building. There's room for a ball game and a church service at the same time, neither would disturb the other. 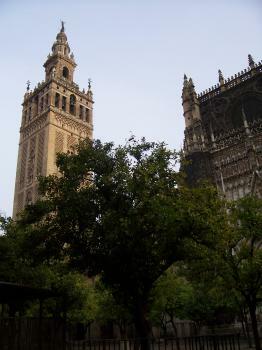 Its bell tower, The Giralda, is one of the finest examples of Moorish tower architecture. The Cathedral is huge, and a portion of the ceiling vaults are embellished by barnacle-like encrustation. There are 45 yard-square sculptured scenes, each filled with intense detail. The City of Seville and its Cathedral are fascinating and attractive, and certainly deserved much more time than we had available, that time. 4.5: Stanislaw Warwas Ilya Burlak Frediehung Stanimir Antonio J. Built in the 13th century: "Criterion (iii): The Cathedral - the largest Gothic temple in Europe - and the Alcázar of Seville bear exceptional testimony to the civilization of the Alhomads and to that of Christian Andalusia dating from the re-conquest of 1248 to the 16th century"